Federal employees overwhelmingly believe President Trump does not respect them, according to a new survey, and a plurality think he has negatively affected their agencies’ missions. 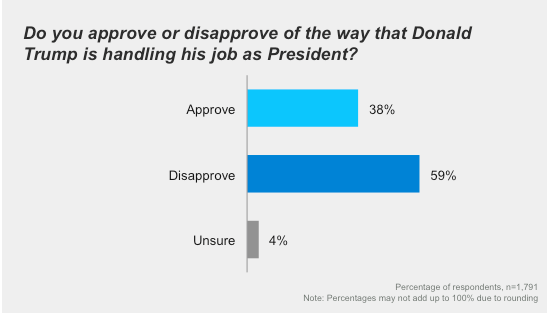 Overall, 59 percent of federal employees disapprove of how Trump is handling his job as president after his first year in office, while 38 percent approve, according to a Government Business Council and GovExec.com survey. His disapproval is slightly higher among federal workers as measured by GBC than in the average of polls among the American public writ large, and his numbers among feds have dipped slightly since May from a GBC poll conducted after Trump’s first 100 days in office. Just 28 percent of federal employees believe Trump respects them, while 58 percent think he does not, the GBC survey found. The president has, at times, disparaged federal workers at agencies such as the FBI and in the intelligence community, and his Office of Management and Budget has called on all agencies to come up with comprehensive plans for reducing their workforces. A majority of federal employees—53 percent—said they are not familiar with those plans, which will include blueprints for agencies to reform and reorganize themselves. Agencies turned over initial versions of their plans to OMB in June and final drafts in September. Lawmakers and various advocacy groups have criticized the secrecy of those proposals, which the administration said it would make public when it releases its fiscal 2019 budget. Slightly less than half of feds are familiar with the plans, according to the survey, with a majority of those individuals saying they are only “somewhat” familiar with them. To the extent the plans are known, they received relatively positive reviews: 39 percent of those familiar with the plans said they support them and 29 percent disapproved of them. Respondents generally felt Trump was having a negative impact on their agencies’ missions, with 43 percent expressing that view. Only one in four feds said Trump has had a positive impact, while about one in three said he has not made any impact. One federal employee, given anonymity to allow honest answers to the survey, said Trump is breeding a contemptuous workforce. “A negative and demeaning attitude towards federal employees creates negative and demeaning employees,” the respondent said. Another said employees are overreacting to Trump’s presidency. 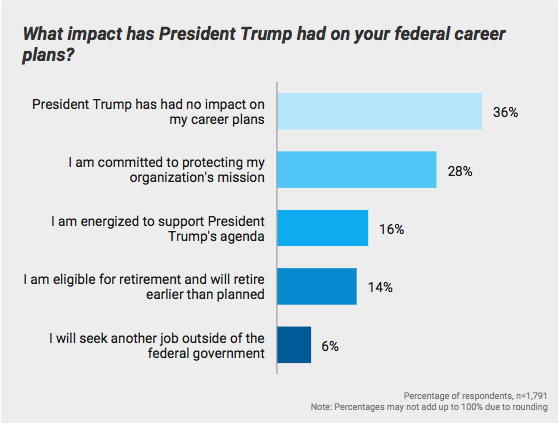 One in five federal employees indicated they would leave federal service because of Trump, a majority of whom are retirement eligible but will separate earlier than they had previously planned. Three in 10 respondents said they would leave the government within two years. Four in 10 said turnover has already noticeably increased in the last year, with an equal portion saying it has not. Trump and his allies have consistently railed against the “deep state” subverting his agenda; just 16 percent of feds said they were “energized to support President Trump’s agenda.” Another 28 percent said they are committed to protecting their organization’s mission. Just 3 percent of Democrats were energized for Trump’s agenda, compared to 31 percent of Republicans. One respondent supported Trump generally, but took issue with one part of the president’s habits. “I don't agree with the way President Trump uses Twitter but I agree with and support his agenda,” the employee said. More than six in 10 feds said Trump has negatively affected the government’s reputation, while fewer than three in 10 said he has had a positive impact. Respondents were nearly evenly split on the impact of Trump’s political appointees at their agencies, though a majority said the president has not clearly articulated a management agenda. 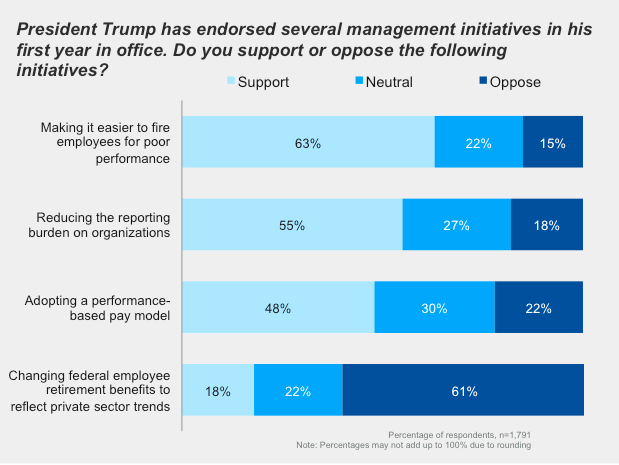 Federal employees support several of Trump’s key initiatives as they relate to the workforce and management, however, including easing the firing of poor performers and establishing a link between pay and job performance. Unsurprisingly, the survey respondents overwhelmingly rejected a proposal to shift away from a defined-benefit pension. 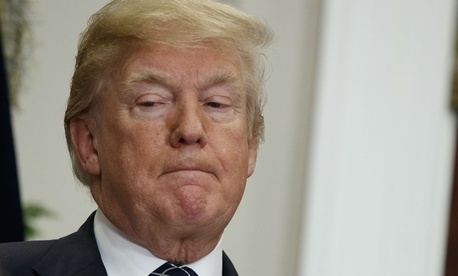 Sixty-four percent of respondents, including 43 percent of Republicans, said they believe the ongoing investigation into the Trump campaign’s associations with Russia has had at least some negative impact on his ability to lead the country. GBC fielded the study to an audience of Government Executive Media Group readers from Jan. 5 to Jan. 8, 2018. The sample is made up of 1,791 respondents, 24 percent of whom identified as Democrats, 24 percent as Republicans and 37 percent as independents. The survey has a margin of error of plus or minus 2 percent. For full results, click here.